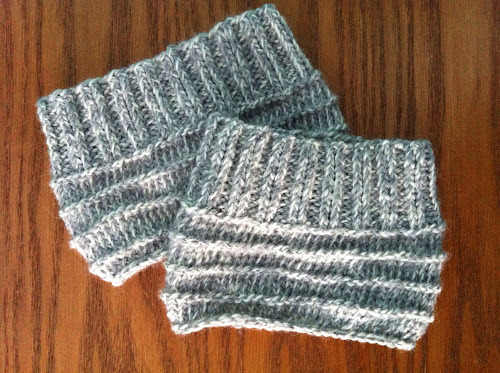 Penelope Rae: Knit Boot Cuffs- Free Knitting Pattern! Should it be 72 stitches to cast on because then it's a multiple of 4 and the ribs work out? I used Encore Plymouth Yarn worsted and 74 stitches were way too many. I have to find someone in my family with huge calves now. Check out other boot cuffs and you'll find most of them have you cast on even numbers in the 60's. This is the only pattern I found that calls for that many stitches. Way too many stitches. I'm doing ladies hats with only 84 stitches. Use 64 stitches to get to the 13" referenced. Thanks Joanne. I just did the ribbed area for the larger side...I don't know any men who would wear these. I love the cuff, just need the instructions to be accurate. Thanks for all the comments about way too many stitches. I am adjusting my pattern for 60 stitches and maybe even down to 40 for the tiny teen grandchildren in my family! Will just have to see what works after a few rows. Love the cuff idea, though! Hi! I am new(er) to knitting and need to know what the acronyms of (RS),(WS), and (P2tog) are...thanks!! It would be great if you'd change your original pattern to 60 stitches if that is what is needed. Luckily I read the comments before making your awesome pattern. If an 8 year old has a 12 1/2" calf, how many stitches would be suggested? She really likes the pattern. Help! What does "13 in around" mean? I dont understand the directions.. the first 13 rows are K2,P2.. then the next line is Body before the rows of stitches ..they dont match... 4 rows of K, a purl, 4 rows of K, etc....can someone explain please...?.. Just made the first one as described and it's way too big at the top. I just read the comments and will try the second one with 60 stitches. I'll probably have to make a third to be able to wear them. I have a question based on the January 9, 2015 comment by Mona Simpson-Premorel...I have the same issue you have...I do not understand it either. I love the pattern and the ladies of the family want some but I wish someone would tweek the pattern for accuracy and punctuation then republish it. To get the right measurement measure your calf. Do a swatch of the yarn you want to use. That will give you how many stitches in an inch. Multiply the number of stitches by the desired circumstance. This will give you the correct number of case on stitches. Happy knitting! I used Patons classic wool, cast on 52 stitches on a 4.5 mm straight needle. I did about 5 extra rows in pattern, to make them as long as if I had used the recommended needle size and cast off loosely. This fits my thin teen's legs and looks good with the mid calf boots that are so popular right now. P.S. before I cast off I did knit 1, knit 2 together repeated. Then cast off loosely. I think the knit 2 together all around before casting off was too tight. Unfortunately, I knitted first cuff before reading comments. My cuff turned out way to big. Knitted second boot cuff casting on 60 stitches which fitted my calf's perfectly. This is a nice pattern but shame amount of stitches wasn't altered by writer! I like thicker yarn and bigger needles so i found if i did use them i CO 30 stiches and if i used her size needles i did do about 50 to 60. It depended on how loose or tightly you knit.